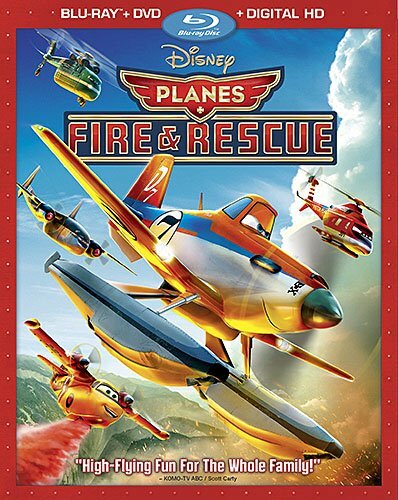 The first Planes was alright, it was enjoyable but didn't really make me clamoring for a sequel. So when the sequel came out, I didn't go see it. And now after watching it on blu-ray, I do regret not seeing it in 3D in the theater. The flying scenes were fantastic on blu-ray and I can only imagine what they would have looked like in glorious 3D. I also enjoyed the story more this time around. Previously cropdusting plane Dusty dreamed of being a racer and was able to fulfill his dream. This time around we find him enjoying his successful racing career when he learns his gearbox can no longer take the strain of racing. The gearbox is no longer made and is too complex to be repaired, and thus Dusty winds up embarking on a new career path as a fire fighter. This movie has laughs and heart, disappointment and heroics. It's a fun ride that gets you emotionally involved with the characters. The visuals are really great, especially the scenery when the planes are flying over. Some of the stuff in here actually looked completely real. Computer animation has come so far since Toy Story days! There was also a CHiPs parody TV show called CHoPs with helicopters instead of motorcycles, and that was a hoot. One of the extra features is even a promo for that show. There are about a half hour of extra features included. Air Attack: Firefighters from the Sky gives insight to the real fighter fighters in the sky which was cool. The two deleted scenes are unfinished, with one being only storyboards. But that's kinda common with deleted scenes from animated films. Vitaminamulch: Air Spectacular is the only extra that's on both the blu-ray and the DVD. It's a short where Dusty has to masquerade as stunt plane Air Devil Jones when he fails to show up. I enjoyed this movie more than the original Planes and Disney gave it a good release with this set.